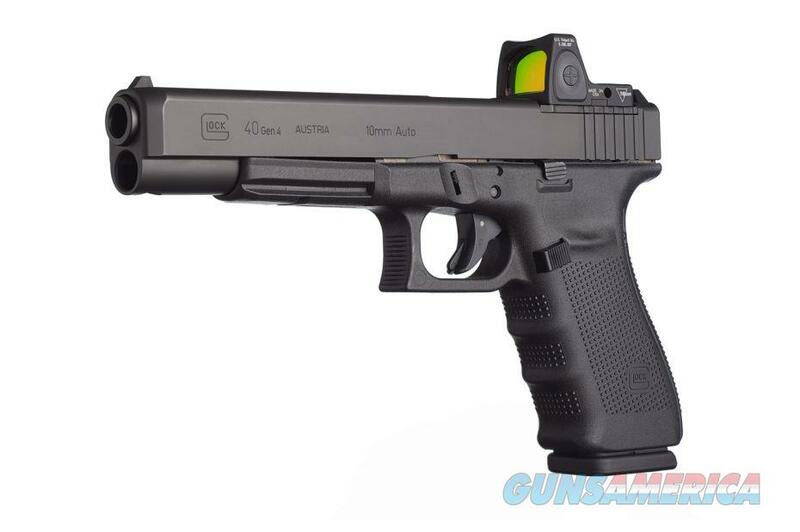 The G40 Gen4 in the MOS Configuration is chambered in 10mm and combines a full 6-inch barrel for an improved velocity with a magazine capacity of 10 rounds. The G40 Gen4 in MOS configuration is a powerful yet easily carried pistol; perfect for the outdoorsperson, hunter and sport shooter. It is designed to give the handgun hunter the ultimate choice in semi-automatic gaming pistol and has proven to be more than capable of taking down game such as Whitetail Deer, Russian Boar and even Feral Hogs. Comes in factory hard case with 5 interchangeable backstraps, 3 - 10 round mags, cleaning tools and mag loader. LENGTH BETWEEN SIGHTS: 8.19 in. WEIGHT - UNLOADED: 28 oz., LOADED: 40 oz.